Rear of 15-17 Centre Avenue, 1937. City of Toronto Archives, Fonds 2008, Series 372, Sub-series 33, Item 138. As the population and land values in the city core soared in the late 1800s, properties in the Ward became very profitable. While waiting for property values to rise (between 1909 and 1917 the values of most properties in the area tripled), landlords transformed single-family dwellings into boarding houses or built cottages fronting on the back alleys. Some houses harboured anywhere from ten to thirty people. Many dwellings rented to single families also became overcrowded as boarders were taken or houses were sub-let to help meet the high rents. Since the goal of landlords was speculation and demand for housing was high, there were few incentives to improve properties. A report of the Medical Health Officer of the city in 1911 found 619 houses without drains in “The Ward.” 166 families had no water supply in their houses. 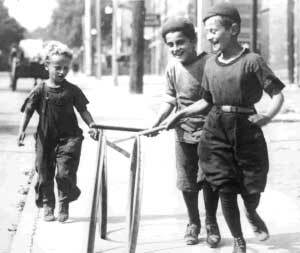 “Greek, Hebrew, Polish children rolling hoops,” Chestnut Street, 1922. Toronto Public Library (TRL), T 13358. In a neighbourhood of crowded houses and backyards filled with outbuildings and cottages, children turned the streets into a vast playground. There was one city-sponsored play area for the district and even that was closed on Sundays for many years. In contrast, the streets were said to be generally paved and in good condition. Chestnut Street was a favourite with children as traffic was light on weekends. The columns of the Registry Office at the corner of Albert Street were perfect for games of hide-and-seek. Hillock’s Lumberyard, across the street from Osgoode Hall, was closed on weekends, was easy to get into, and provided many opportunities for adventure. 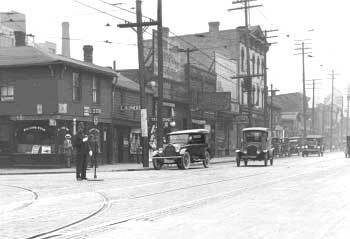 Queen Street West and University Avenue, looking south-east, c. 1924. City of Toronto Archives, Fonds 1244, Item 7160. The view up University Avenue may have inspired eloquent praise but the view south, ending at Queen Street, did not. One author complained in 1884 that the gate on Queen Street was mean, squalid and unpainted. “As we look down [University Avenue’s] vista of pink-blossoming chestnuts, we meet an anti-climax, the meanest part of Queen Street blocks our view of the Bay, and in that mean part of Queen Street nothing is meaner than the entrance to College Avenue [now University].” University Avenue was extended south of Queen Street West in 1931. 100-110 Elizabeth Street, 1937. City of Toronto Archives, Fonds 2008, Series 372, Sub-series 33, Item 178. Toronto witnessed an influx of Chinese immigrants from British Columbia after the completion of the Canadian Pacific Railway in 1885. Many early settlers were employed in the secondary industries. In 1893 there were 24 Chinese laundries in Toronto. Their numbers had risen to 374 in 1921, despite government efforts to curb Chinese immigration. The proclamation of the Chinese Immigration Act and its drastic restrictions in 1923 put an end to new arrivals. In 1890 seven Chinese laundries operated along Queen Street West, a Jewish neighbourhood at the time. 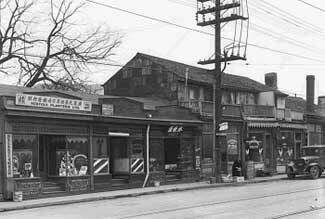 As the Jewish community shifted towards the Kensington Market area, the Ward became distinctively Chinese in character. The district was the heart of Chinatown until large portions of it were cleared in the late 1950s to make room for new City Hall. 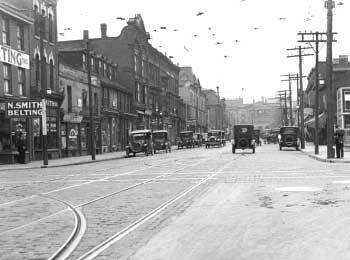 Queen Street West at York Street, looking west, 1925. City of Toronto Archives, Fonds 1244, Item 7106. Osgoode Hall was always well served on the transportation front. As early as 1861 there was a horse railway on Queen Street from Yonge Street to the “Lunatic Asylum.” The electric railway was introduced in 1892. In 1954 the City was considering a Queen Street subway line but by that time the traffic patterns were shifting and the line was moved to Bloor Street. At the time this photo was taken, horses were still sharing the road with cars. However, since the introduction of the first mass-produced automobile, Ford’s Model T in 1908, the car’s popularity had grown phenomenally. In 1925 there were 303,736 cars registered in Ontario. Car-related taxes were the second largest source of provincial government revenues. Registry Office, north-east corner of Albert and Chestnut Street, n.d. City of Toronto Archives, SC 268, Item 1660. The Registry Office opened in 1915. 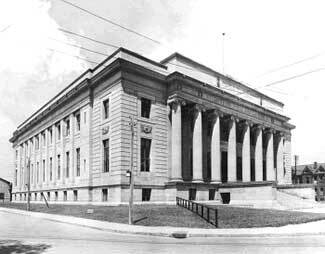 The building was to be the first phase in the Federal Avenue Project put forward in 1911. The project entailed a broad roadway from Front Street to Queen Street, between Bay Street and York Street, leading to a complex of civic buildings and public grounds at the current location of City Hall. The plan was eventually abandoned and the Registry Office languished in the middle of the neighbourhood the project had sought to eradicate. The building had its hour of glory when the site for City Hall was cleared. Unfortunately, it had not been included in the competition for the new civic building, did not fit the style of the project and was eventually demolished. 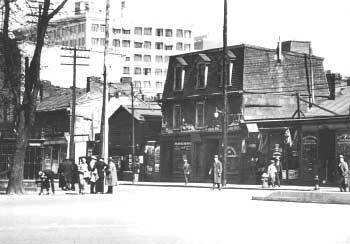 York Street, looking north from Adelaide Street, 1920. City of Toronto Archives, Fonds 1244, Item 7389. The second-hand stores that saddened Mulvany in 1884 were still entrenched on York Street in 1930. 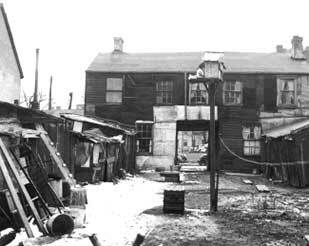 Industrial supplies, employment agencies, tailors, pool rooms, bath houses and cheap restaurants did not make for a glamourous neighbourhood but one that catered to the mix of working class residents, industry and commerce of the district. The transition from what was essentially a residential purpose to mixed use had occurred around World War One. Some social activists blamed this shift for the residents’ loss of neighbourhood ownership and the consequent degradation of living conditions.